For those who don’t know, my boyfriend and I adopted our dog Kuma from a rescue in Houston last year. We found him on Pet Finder and had a few calls with his foster mom before we were approved to adopt him. He flew up to Seattle in July of last year to be part of our family! I grew up with dogs. My mom loves Black Labs and we always had one or two around the house. When I moved out I knew that once I was financially stable, I would adopt my own dog. I loved our labs, but I couldn’t justify spending a couple thousand dollars on a puppy when there are so many abandoned dogs that need homes. Purebred dogs can also have a lot of genetic health issues, and I didn't want to risk that either. Kuma has quirks as a rescue, but working with him on overcoming them is so rewarding for us. With that said, the journey hasn't been perfect. Some parts of dog ownership I was prepared for, other parts took me completely by surprise. Here are 10 things Kuma has taught me about adopting an adventure dog in the last year. 1.) There will be many places you can’t adventure with your dog. Most National parks don't allow dogs on trails outside of main visitor centers. There are also a lot of trails in wilderness areas that don't allow dogs. Do your research before you go and know whether you can bring your dog with you. Don’t be a jerk and pretend your dog is a service dog so it can hike with you. This is invalidating to people who ACTUALLY need service dogs. It’s not all about you, your dog, and your needs. These are public shared spaces. Respect the rules and have plans in place when you visit areas that don’t allow your pup. This is a popular hike in Olympic National Park that does not allow dogs under any circumstances. There are also many dangerous portions of this hike that are not suitable for dogs. Bringing your dog here is illegal and a bad call. A popular hike in Mount Rainier National Park that also doesn't allow dogs. Instagram photos like this pop up all the time, please don't be this person. My partner doesn't enjoy backpacking or hiking as much as I do. When I have a trip planned where Kuma isn't allowed Brian takes care of him. On trips where Brian comes along, we use a pet sitting service like Rover. We have also asked friends and family to watch Kuma for those last second too-late-to-find-a-sitter situations. There are a lot of options, bringing your dog to a place it's not allowed is not one of them. 2.) They won't immediately be an adventure dog. I waited a month to take Kuma on his first easy hike. We started with short runs around my neighborhood and walks in wooded areas. He was a stray before we adopted him and had a lot of endurance to wander long distances, but he wasn't used to being on a leash around people and dogs. This made him anxious and reactive at first. We did obedience classes and he has gotten a lot better over time with this. I still avoid super crowded trails with a lot of children and other pups when I take him along. I don't want to ruin hiking for him or someone else if he has a leash reactive moment. Be patient with your adopted dog, they are already learning how to adjust to life with you. Immediately expecting them to be a pro on the trail is asking for a frustrating experience for both of you. 3.) Weekend warrior? Be realistic about how often you can exercise your dog during the week. Kuma seems relaxed but he is actually preparing to chase an unsuspecting chipmunk. When I adopted Kuma, I dreamt of the adventures we would have in the mountains together. All our weekends would be spent frolicking about on a mountainside somewhere. When Kuma arrived, reality slapped me in the face. Dogs need to exercise, A LOT. I knew this, but my childhood dogs had a yard to frolic around in. I could open our sliding glass door and they would run outside together for hours. Boom, exercise accomplished. Brian and I live in a one-bedroom condo with no yard so we spend a lot of time walking and exercising Kuma on weekdays. Luckily, Brian has a lot of flexibility at work so he is able to walk Kuma or take him to dog parks during the week. When Brian is busier at work we hire a dog walker to get Kuma out and about. I have also started signing up for half marathons so I can take Kuma on training runs with me on weeknights to help. The amount of exercise a dog needs will vary by breed, but if you are adopting a dog hoping it will hike with you I am assuming it will be a mid to high energy breed. Don’t assume your weekend adventures are enough exercise for your dog. Have plans in place to keep them tired and happy throughout the week. 4.) Hide your expensive gear and anything else you love from your dog. When Kuma ate the boxing handwrap, it was anchored in his stomach but had wound it’s way through all his small intestines. As a result, they were being bunched together which made him super sick. He was vomiting everywhere, wouldn’t eat, wouldn’t get up and it was very clear something was wrong. We took him to our vet and they discovered the handwrap in his intestines and decided it needed to be removed immediately. Six thousand dollars later, a groggy pissed off Kuma was returned to us with a 12-inch scar down his stomach. You may think you don't need pet insurance. I wondered if I was throwing $40 away every month until Kuma needed this surgery. Having pet insurance allowed me to make the choice that was best for Kuma's health without worrying about the cost. Our pet insurance covered 90% of that $6000 vet bill and I was so thankful we had it. Knowing Kuma, I am sure he will find something else that will make me thankful for it all over again. We use Healthy Paws and after this experience I highly recommend them! This is the face of a dog that hates snow. Kuma has a super short coat and no fur on his stomach. I have bought him a warm coat, a raincoat with a hood, a fleece vest, and some Mushers Wax for his paws. Even after all this, he hates hiking in the snow. Correction, he is fine with the hiking part, he is not okay if we stop when there is snow on the ground. He stands there, shivers, and starts barking at me if we aren't moving. So, I stopped taking him on winter hikes. We are both happier with him being warm at home! Kuma also isn’t a fan of camping. I don’t know what happened to him in his past but being in a tent stresses him out. So much so that he tore a hole in a brand new tent trying to escape when Brian and I brought him in with us. I am trying to get him more acclimated to the tent at home, but currently, he still seems to hate it. Moments before Kuma shredded a hole in the tent door. After these experiences, I started to realize there is no need to force my dog to go on certain adventures he never seems to enjoy. Some things can be trained, but sometimes it’s your dog’s unique personality and that should be respected. 7.) Dogs have a different threshold for heat. A quick google search for, "dog death while hiking" yields a lot of results on dogs who died from heat exhaustion on summer days. Their owners weren’t terrible abusive people either. Like most people, they thought a summer hike with their dog was a good idea. By the time they realized their dog had heat exhaustion it was too late. I read a lot of these stories and I was terrified I would accidentally kill Kuma on a hike. I would stop at every other switchback and try to force him to drink water, even if he wasn’t panting. You don’t have to be quite this paranoid but learn about the signs of heat exhaustion in dogs so you can catch it before it's too late. Dogs also have issues with their paws on exposed trails. Doris recently had an incident where her boyfriend’s dog burned his paws on a hike and was unable to finish hiking down. Her boyfriend had to carry his 80lb dog over his shoulders the final mile of the trail. No one loves Loki more than those two, it's just hard to tell how hot the ground is since we wear rugged hiking boots. If it's the middle of the day in summer test the ground with your hands. If it's too hot for you, it's too hot for them. You can prevent this by purchasing dog boots, or mushers wax to protect their paws. If you are unsure if it's too hot for your pup it's best to avoid midday summer hikes. Hike close to sunrise or sunset so you won't need to worry about the heat at all. 8.) Not everyone wants to meet your dog on the trail. I was hiking with Kuma and the trail was too narrow to pass another hiker, so Kuma and I stepped to the side and allowed her to pass. As she passed she thanked me for giving her space and having my dog on a leash. She was attacked by a dog when she was younger and has been terrified ever since. It’s extremely traumatizing for her to be approached by a dog whether on-leash or off. Cute and fluffy to me, terrifying demon to others. Kuma loves humans and will run up to anyone if I let him. Hearing her story definitely made me rethink allowing him to do this. I love Kuma and think he is the cutest thing in the world, but not everyone does. In shared spaces, it’s important to be mindful of others experiences and train my dog to behave appropriately. This also applies to other dogs. Leash reactivity is common and it can be extremely stressful for a dog and their owner if your dog runs up to them unprompted. Only allow your dog to meet people if they ask or show interest in petting them. Otherwise, step off the trail and allow them to pass and enjoy their hike. Someone once asked me, "Bears poop in the woods and leave it, why is there a problem if my dog poops in the woods and leaves it?" Bears are native to the areas they poop in. There also aren’t hundreds of bears going up and down the same trail in a day. 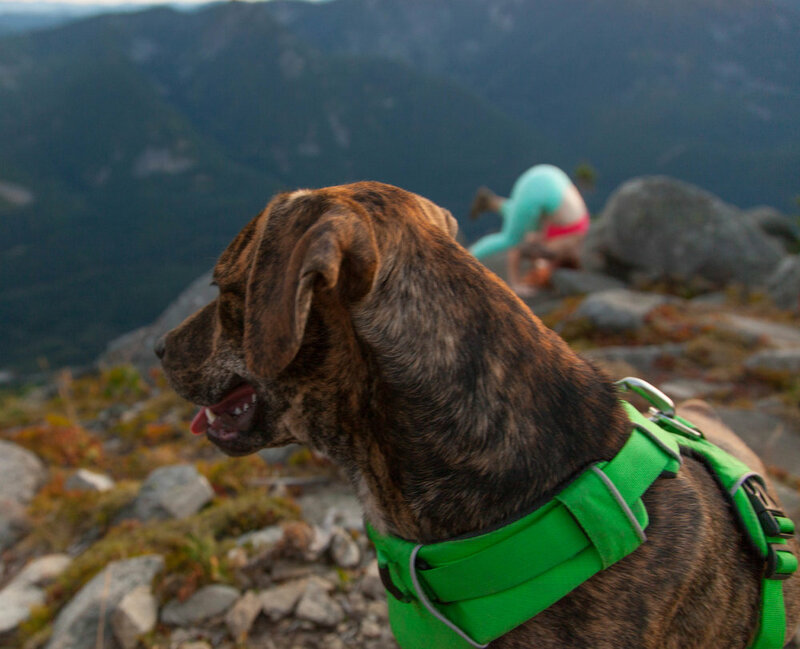 Imagine if NO ONE picked up their dog’s poop at the most popular hike near you. It’s gross, and you wouldn’t want to hike there anymore if the trail was nothing more than a trail of dog poop. Your dog's little gift can also break down and work its way into nearby streams and water sources and contaminate it. Think about that while you are filtering water on your next backpacking trip. Not pictured, my backpack fllled with Kuma's poop bags. All around, it’s gross. If your dog poops, pick it up and pack it out. Do not leave it in a bag on the side of the trail. If you can’t handle this responsibility, you can’t handle the responsibility of hiking with your dog. If the prospect of carrying our your dog's poop bags in your backpack or hands grosses you out invest in a dog hiking backpack and make them carry it out. Problem solved! Don’t stop with their poop though, you can learn more about the seven Leave No Trace Principles here. Apply these principles to every hike/camping trip you take your dog on! 10.) Be honest with yourself about whether your dog can be off leash. Do they have perfect recall? Will they return to you every time you call their name regardless of all distractions? Do they leave other humans and dogs alone? Or do they run up to them unprompted? Is the trail safe for an off-leash dog? Are there steep drop-offs, cliffs, or dangerous wildlife? If so can you trust your dog to make smart decisions with those things around? If you said no to any of these it's best to leave your dog on a leash. Your dog will be safer enjoying the trail with you, and others you are sharing the trail with will appreciate it. When I asked myself these questions I decided Kuma can’t be off leash. His recall is still terrible even after a year of training, and he runs up to every person and dog. As far as I am concerned he will always be a leashed dog and I have no goals to hike with him off leash. It doesn't change the amount of fun we both have, and it makes everyone else happy. It's an on-leash life for this dog! None of this is meant to scare you away from adopting an adventure dog, but to help you make the best decisions for yourself and your potential dog. Adopting Kuma came with its own set of challenges, but it’s been worth it. My favorite moments on the trail have been with Kuma as he overcomes fears and challenges. Sometimes it can also be the car ride home when he is too tired to move for the next few hours. Did you adopt your adventure dog? What challenges have you faced along the way? I would love to hear your stories in the comments!